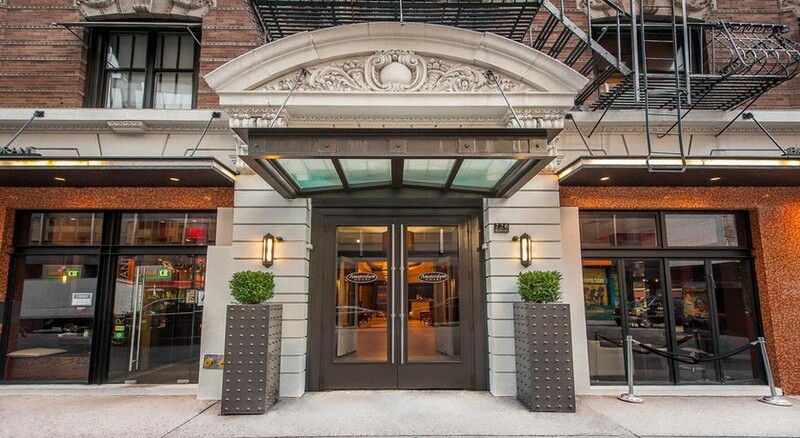 Amsterdam Court Hotel is located a block from Times Square, the entertainment hotspot of NYC. 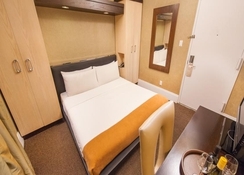 the hotel is close to several of Manhattan’s attractions including the Radio City Music Hall, Columbus Circle, Rockefeller Centre, Central Park, Gershwin Theatre, August Wilson Theatre and many more. 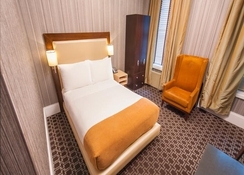 Plan your next visit to the city at our affordable hotel to experience all that the bustling metropolis has to offer. The Theatre District is only 500m from this posh Manhattan hotel; and the 50th Street Subway Station is only 100m. The hotel offers snug accommodations and splendid restaurants. Rockefeller Centre and the Museum of Modern Art are only 700m from the Amsterdam Court Hotel. Central Park is also within walking distance at 900m. Gershwin and August Wilson Theatres are few hundred metres from the hotel. The LaGuardia Airport is 17.7km from the property. All the 136 guestrooms feature Art Nouveau styled furnishings and offer personalised services. 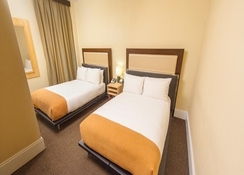 Guests can choose from Superior King, Deluxe Double, Deluxe Double (Accessible), Deluxe King, Standard One Bed, Standard Queen, Standard Queen (Accessible) and Leisure Room. Many of these offer excellent views of the city’s skyline. The rooms are furnished with flat screen TV, built-in storage, track lighting, upholstered reading chair, desk, wired and Wi-Fi access (surcharge), shower/bath tub, C.O. Bigelow toiletries. 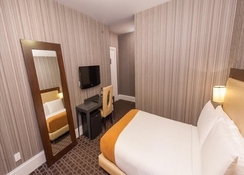 Whether your trip to NYC is for business or leisure, be confident that you’ll find everything you need at The Amsterdam Court. Guests can start their day in the correct approach with complimentary morning coffee and tea served between 6am – 11am. Enjoy cocktails, tapas and luxurious entrees at the Natsumi Edifice Bar & Lounge, which also serves lunch and dinner at the lobby level. The wine list here is international, with white, red and sparkling wines and champagne by the glass and bottle. Natsumi restaurant is split into distinct feeding areas, a comfy area with intimate booths, a bar wherever diners will watch the chefs make their meals, and from the front windows the street outside. The hotel has paid Wi-Fi. Guests can lounge in the lobby with newspapers and enjoy complimentary tea and coffee. The hotel being in the Theatre District is steps away from good theatres and concert. Step out to Times Square to get a glimpse of NYC’s multicultural, urbane lifestyle.